Geez our mate Einstein knew a thing or two eh? Smart guy. At HeadUp, we make no apologies for the fact that we’re all about facts (and for the fact that we’re completely obsessed with Albert Einstein). We base all of our thinking, our knowledge and indeed our philosophy, on science – rigorously tested, indisputable, hard data. But if there’s one thing we’ve learned on our mission to discover every meaningful data point around your health, it’s that delivering a fact on its own doesn’t work. No matter how interesting or even astonishing a fact may be, by itself it’s lost. The rational needs the emotional. The head needs the heart. Thinking needs feeling. Science needs art. Basically, what it means is establish the facts first. Do your research and find out what’s true and what’s meaningful. Get the facts right – and make them as simple to understand as you possibly can. Then, to get people to take notice of the facts you’ve found - add some creativity, some flair, some ‘art’. Anyone can discover a fact (thanks Google). And anyone can deliver a fact (not to be confused with ‘fact’) - just check out how many bloggers, vloggers, diarists and influencers there are these days. The reality is that if you look hard enough, you can uncover the most important, relevant, paradigm-shifting, status quo-altering fact in the world. But if you’re just showing people what is essentially raw data, and neglecting to add the creative, emotional aspect to the message, then nobody’s going to hear it. Or, worse they’ll take away a message you never intended for them to hear. Here’s an example that may be familiar to you. Earlier on this year, Cancer Research UK shared a significant scientific finding: after smoking, obesity is the second most common cause of cancer. On a billboard. Many billboards in fact. Some of the billboards were as big as houses. It caused an uproar, with many people calling the message ‘insensitive’ and claiming that they felt ‘fat shamed’ by Cancer Research UK. These same people argued that the message only served to increase stigma for fat people, while giving society the green light to criticise their weight. And, according to Finer, we’re now in an environment where it’s very easy to over-acquire calories and energy. We’re surrounded by bad food and this contributes to people being overweight. So blaming a person for being obese or overweight is ignoring so many other factors that have contributed to their weight. Further, telling someone they have a significant risk of cancer because of their weight without giving them any other information, context, compassion, sensitivity, or even a bit of colour (the billboard was black and white for Pete’s sake)…what does that achieve? 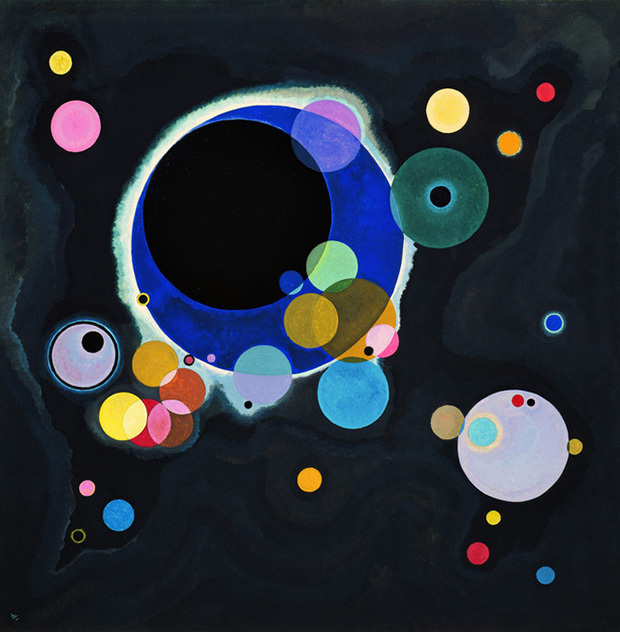 Several Circles (1926) by Wassily Kandinsky, as reproduced in Art in Time, via: https://bit.ly/2rtydws. It's been stated by some art lovers that Kandinksy learnt to observe life so clearly that he was able to draw all of life’s processes in their abstraction and figuration. Processes that could have only been viewed through the lens of a microscope and other scientific instruments. Well, as we saw, it just makes them feel bad. The very people this message was aimed at, felt bad about themselves. They felt attacked. They felt angry. We’re going to take a guess here and say that they probably didn’t feel inspired to go out for a run. So this way of delivering the message could have actually done more harm than good. Cancer Research UK’s response was as black and white as their billboard. They claimed that they never meant to offend anyone. They simply wanted to raise awareness around the link between obesity and cancer, as at the time only 15% of people knew about it. And of course they were right to raise awareness of this potentially life-saving information. But in the end, whether they wanted to or not, they did offend people and, it could be argued, the subsequent uproar received more attention than the message itself. You might be tempted to say that their approach was successful because it reached a lot of people. And you’d be right – it did. But did it inspire those it reached to improve their health? Taking into account the global, negative backlash we witnessed, it’s unlikely. Science is important – but so is storytelling. This story made it even clearer to us that the way you present facts is equally as important as the fact itself. It strengthened our belief that without sensitivity and creativity, you run the risk that your message is lost, ignored, or transformed into something you never intended it to be. So that’s why at HeadUp we’ve made it a top priority to do things differently. We understand that, as much as we love it, all the science in the world isn’t enough to get the message across. It’s not enough to throw a graph at someone’s face (not to mention, it may also get you arrested). Or give them a fact in isolation. Data needs context. We need to say it great – just as much as saying it straight. The aim of our game. We want to help you understand the academic literature behind health and fitness, as well as the science of your own body, so that you can make evidence-based changes to your lifestyle. But we know that scientific research can come across as scary and overwhelming, cold and clinical, creepy and Frankensteiny. And that it can be hard to digest in general. So each and every day, through our actions, personalised insights, social media posts and yes, our blog, we merge creativity, emotion, humanity, and sensitivity with the science of the human body. We work to entertain you, make you laugh, and inform you, so that you are more likely to reflect on your lifestyle in the context of research findings. Basically, our number one aim will always be to help you stop and smell the science in the most creative ways we can. Newer PostTo exercise in sickness or just in health?